Star Wars: The Force Awakens is just around the corner, and one thing’s for sure, it’s going to be HUGE. 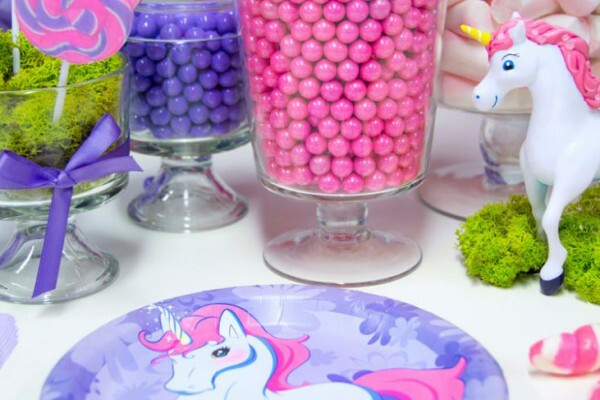 Not only are there approximately six million new toys and accessories for sale, it’s sure to be an incredibly popular birthday theme for the forseeable future. And it’s not just Episode VII that’s blowing up; the Original Trilogy is enjoying a renewed popularity right now, too. So if you want your child’s Star Wars party to stand out from the rest, you’re going to need something extra special. Luckily, our friends at Cakes.com have a great idea. Instead of a simple storebought sheet cake, why not try these galactically awesome Star Wars cupcakes! 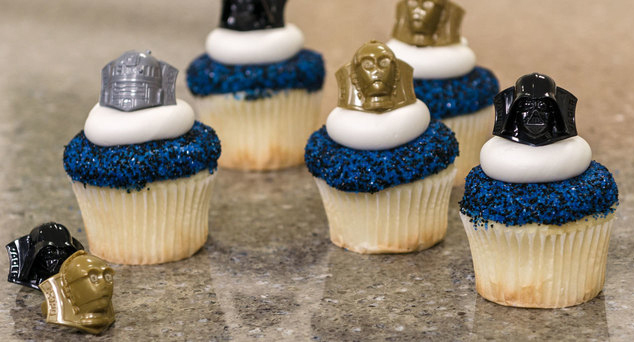 Perfect for a Star Wars birthday or movie-watching party, each guest can pick the cupcake ring with their favorite character: C-3PO, Darth Vader or R2-D2. 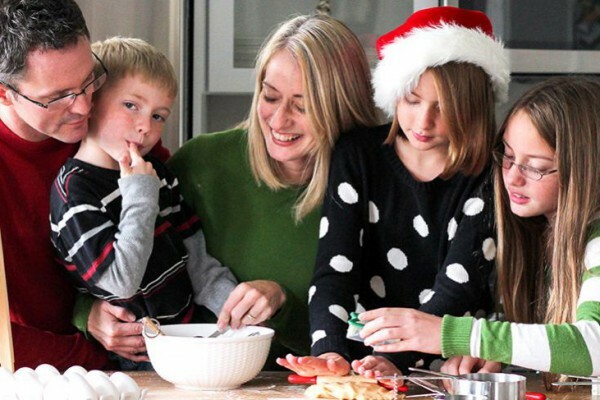 Click here to see a full party design for your Star Wars Force Awakens party! Bake 24 cupcakes and let cool completely. 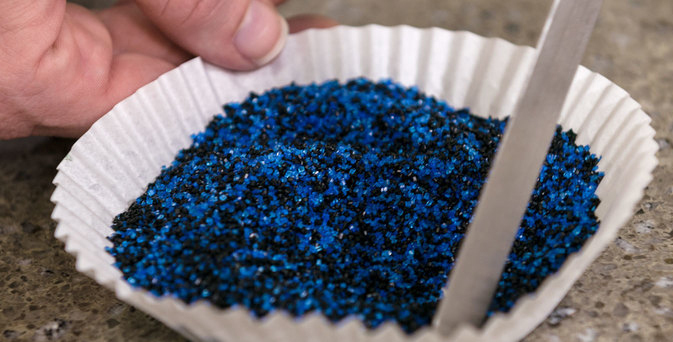 Before decorating, make a 50/50 mix of Black Sanding Sugar and Dark Blue Sanding Sugar in a bowl (or you can use an empty cupcake wrapper in a pinch, like we did). 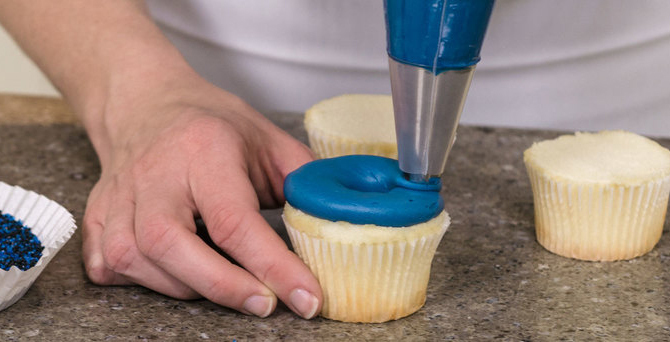 Cut the tops off the cupcakes with a serrated knife so they are flat. 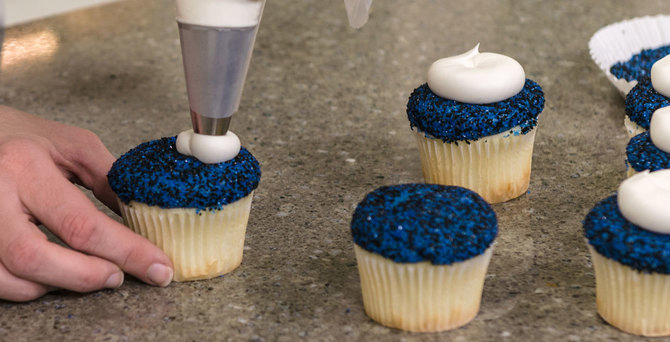 Then, pipe a single layer of navy blue icing onto each cupcake. 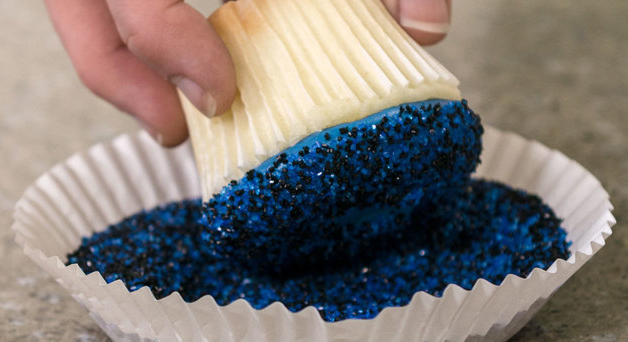 Immediately roll iced cupcakes into the sanding sugar mix. Pipe a dollop of white icing on top of each cupcake with XL Piping Decorating Tip #807. 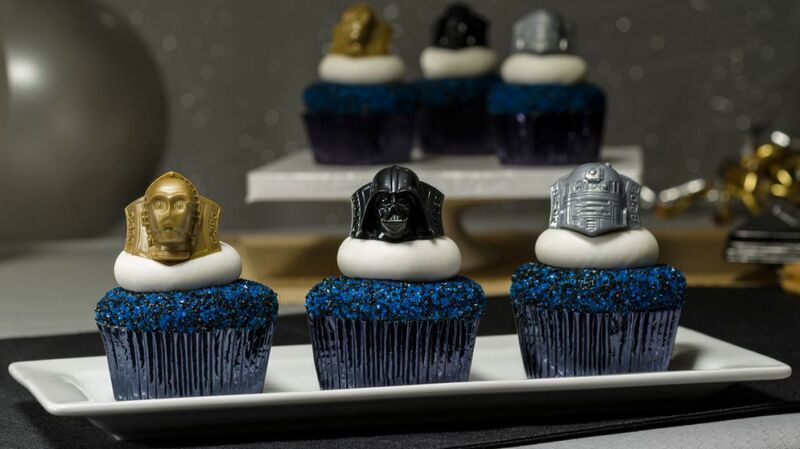 Place the Star Wars Darth Vader, R2-D2, C-3PO Cupcake Rings into the cupcakes. Thanks to our friends at Cakes.com for the recipe and directions. Check out a design for a Force Awakens cake, also from Cakes.com, featuring BB-8! 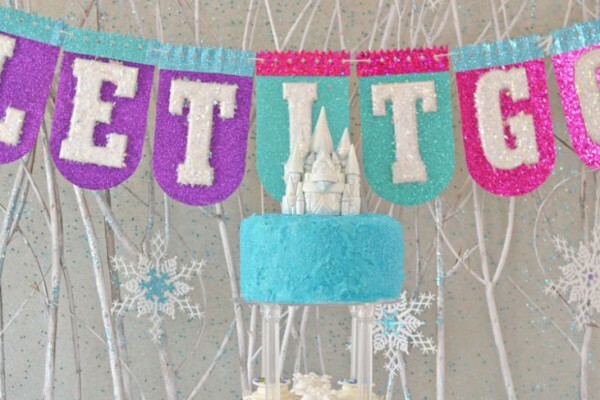 Click here to see a party theme based on the popular animated series Star Wars Rebels! And click here to see our Top Ten List of Amazing Star Wars Cakes! Have we inspired you to throw a totally awesome Star Wars Force Awakens birthday party? 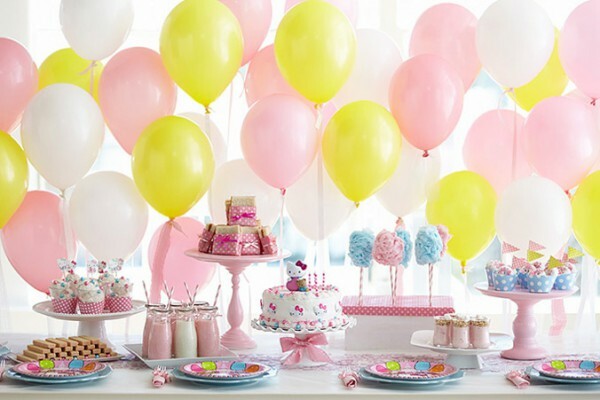 Printables to match our Hello Kitty Balloon Dreams party. Click here for the free download.